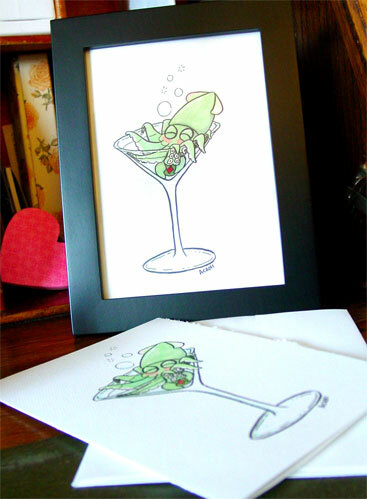 My friend, G, is a big fan of both gin and squid, so one night I drew up this little guy with her in mind. He’s even made friends with the olive, which he’s got clutched in his feeder tentacles, though the gin’s given him a bit of a blush on his fins and cheeks. 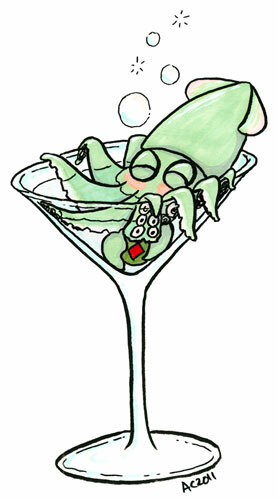 This little squid is sloshed! Squidtini, 5″x7″ pen and ink and Copic markers on paper. I think it would make a great invitation to a New Year’s dinner party, so I made cards for my Etsy shop.